On May 17 of 2011, Mahogany Mason-Kelly (yes, that is her actual name) was cited by the police on a routine traffic stop. The stop became anything but routine, however, when Mahogany decided to falsely identify herself as her sister, Turquoise Mason-Kelley (yes, that is her actual name). 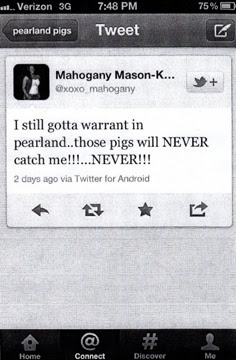 Aside from being a pretty jerk move on the part of Mahogany, it was also very strategically stupid: Her sister had an outstanding warrant for her arrest through the Houston Police Department. After police issued the citation to Mahogany (while believing that she was Turquoise) she signed her sister's name and was promptly arrested. Mahogany, however, was not one to turn down a method acting opportunity. She continued to identify herself as her sister at the police station while being processed, questioned, and signing forms. After police confronted her with fingerprint and photographic evidence, Mahogany finally confessed that she in fact was the sister named after a type of wood and not an opaque bluish/green mineral. 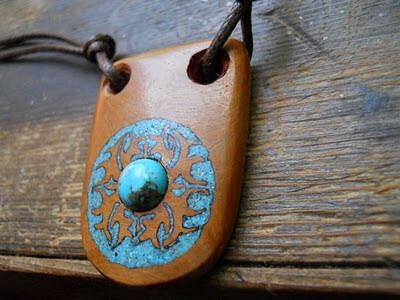 When combined, however, they can form a lovely mandala necklace. But Mahogany's streak of stupidity was not done, yet. After failing to appear in court for her multiple misdemeanors (traffic warrants, tampering with governmental records, and giving false/fictitious information) a warrant was issued for her arrest. for "pearland pigs" was in for quite a treat, apparently. As you can imagine, the police did not take too kindly to being called "pigs," especially on twitter by a girl with a stupid name. This made Mahagony's outstanding arrest warrant go from a the bottom of the to do list to a top priority. 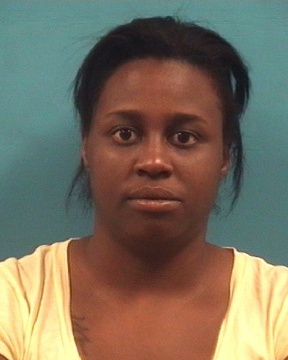 Pearland police traced her to Lamar University, where campus law enforcement were notified. They found, arrested, and transported a very subdued Mahogany Mason-Kelly back to Pearland. Embedded below is a video featuring an interview with a representative from the Pearland police department savoring their victory. It also includes the obligatory "interview/reaction to the story with some random person" that all news reports like this must have for some reason. ...but just in case, RamblingBeachCat.com will be keeping an eye out for this spunky 20-year-old's social media skills to strike again. It shouldn't be too hard to find out what she's up to in the next few months. After all, how many people are actually named Mahogany? ...or use their twitter account to taunt the police? Ahh racism. Good thing the people that shre my skin colour never do anything foolish or lamentable. Love and trust and hatred and magic are the five most important things under my desk. That's a bizzare case where police arrested someone bashing them using twitter. This is a good read, thank you for sharing this one.